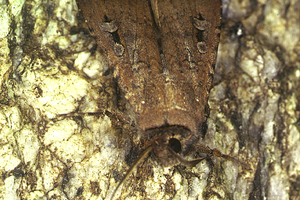 The bogong moth (Agrotis infusa) migrates in large numbers each spring from the western slopes and plains of Victoria, NSW and Qld to the high country of eastern NSW and Vic. Westerly winds sometimes carry them out to the coast and sea, where large numbers perish. Otherwise, the moths progressively congregate at granite outcrops in deep crevices. They cluster in imbricate formation, sometimes emerging at dusk to make short trips, but rarely feeding. They return to the western slopes and plains the next Autumn.